In the decade following the 2008 global financial crisis (GFC), securitised assets in the US have undergone significant reforms. Changes to market practices and regulation have resulted in greater transparency and reduced risk. As a result, interest in securitised products is beginning to grow among Asian institutional investors keen to juice up their portfolios. But, as Doug Weih points out, there still needs to be a better understanding of the benefits and risks inherent within the sectors where the assets derive. As co-head of fixed income at Aegon Asset Management US, Weih is an 18-year veteran of the company’s securitised products with oversight of its structured finance portfolio management team. Weih believes these fixed income instruments offer long-term investors seeking access to the US debt market’s (e.g. consumer, real estate and middle-market corporate lending) valuable opportunities. Also known as structured finance, structured credit or structured products, exposure to securitisation can be an important tool in optimising fixed income portfolio performance. Securitised products account for around 25% of the $40 trillion US debt market according to the US Securities Industry and Financial Markets Association (SIFMA). In comparison to other sectors such as investment grade credit, securitised investments offer attractive value, differentiated returns and the potential to improve portfolio performance through lower correlation. Securitised investments can be used to increase a fixed income portfolio’s diversification since underlying collateral typically comes from multiple sources, given cashflows from multiple sources are less susceptible to negative changes in any single source. It can also be used in multi-sector strategies to enhance yield, shorten duration and to maintain or improve credit quality. ABS products are split between traditional (e.g. credit card, auto and equipment loans or leases) and non-traditional “esoteric” sectors (e.g. timeshare loans, container leases and unsecured consumer loans). RMBS are split into either non-Agency RMBS or Agency RMBS and can be structured to pass principal and interest through to all bond holders, or tranched, to provide cashflows to meet specific investor risk/return profiles. CLOs consist primarily of senior secured debt instruments issued by below investment grade companies (leveraged loans). 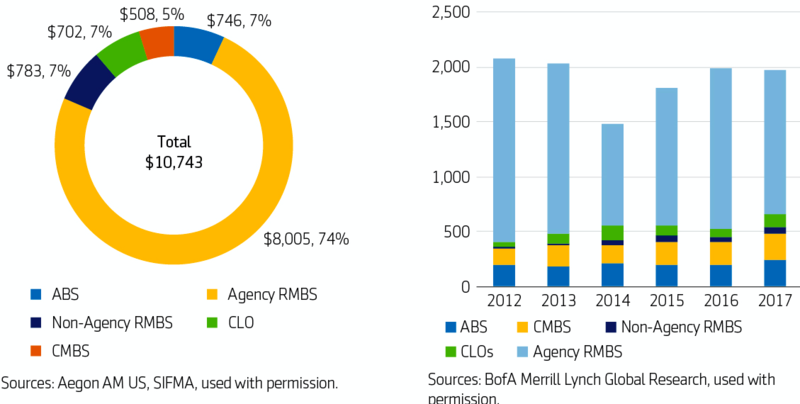 CLO collateral pools normally contain loans from 100 to 200 issuers. Aegon Asset Management US believes there are attractive investment opportunities today in parts of the CMBS and ABS markets, which Weih believes are under-represented in investor portfolios, simply because many institutional investors only have limited exposure to ABS, and CMBS securitised products. To illustrate his point, Weih says many institutional investors invest in the Bloomberg Barclays US Aggregate Index, a $20 trillion index which contains roughly 69% treasury, government and corporate bonds and 31% securitized investments. Aegon Asset Management US has been investing in securitised products since the 1980s and Weih and his team have been together since 2008, so he’s well placed to understand the post-GFC regulatory changes that affect the asset class. Greater transparency of the underlying collateral, the alignment of incentives via risk retention of 5% of the transaction by issuers to ensure they, as Weih puts it, have “skin in the game”; and a generally more conservative and realistic approach by rating agencies are all helping encourage, and give some degree of comfort, to those thinking about investing in this sector. However, he still believes investors should never just delegate decision making on the back of a credit rating. They must do the hard yards with their own analysis, due diligence and views. This article does not constitute an offer or solicitation for the sale of any product or service. The views expressed herein are not intended as investment advice and should not be construed as a forecast or guarantee of future results. The asset classes described herein may not be suitable for your specific needs and you should contact a locally licensed professional for advice. Aegon Asset Management US is not regulated in most jurisdictions and may not be authorized to market or conduct business in a given country.